let us create SOMETHING COMPLETELY CUSTOM FOR you. We offer a completely custom experience. We will meet with you and discuss your likes, your dislikes, your style, your colors, and what it is that makes you you. Our goal is to have your guests open your invitation and think "this is so them!" without even reading your names. Alyson does all the illustrations by hand. She can draw the florals you absolutely adore for your bouquet, or the amazing venue where you're having your big day, or even your dog that can't come to your wedding but you just need him included in the invitations. For more info on how our process works, including pricing guidelines, check out our FAQ section. Custom design not for you? We have over 50 existing designs to choose from, fully customizable with your info and colors! Whether you come in and see our samples in person, or you complete your order entirely online, we will still be with you every step of the way. You still get our extensive online proofing process and full customer service experience, so you are sure to find something that fits both your style and your budget. Our event invitation options are broken up into three product categories, our Standard Suite, our Couture Suite, and our Specialty Printing options. See something in one category that you'd like with the features of another? Yeah, we can do that. Don’t forget to check out our FAQ section for details on how our process works! invitations are anything but basic. Pricing for these starts at $5.00, and that includes your layered invitation, RSVP postcard, and blank outer envelope. You can upgrade to an RSVP card and envelope, add enclosure cards, return address printing, calligraphy, or any of our other completely customizable options that will make these invitations perfectly yours. Contact us today to set up a meeting! A simple, classic invitation is spiced up with the surprise of a floral envelope liner. 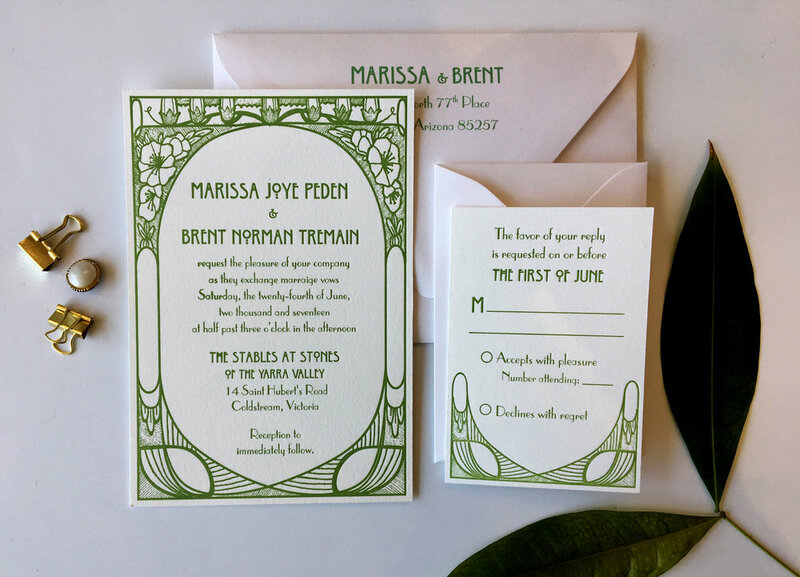 Shown here as an engagement invite, this style is extremely versatile as a shower, save the date, or wedding invitation, and looks equally as lovely in digital printing as letterpress or foil. Reminiscent of old botany illustrations and seed packets, this suite is charmingly "vintage" without being too trendy. Suite pictured with RSVP postcard, but is can be upgraded to an RSVP card and envelope. Shown with a deep green layer, but available in any color or an upgrade to a pocketfold for the Couture Suite. A modern floral design, inspired by a florist flatlays of deconstructed bouquets. Featured here with metallic gold foil with matching envelope liner but is available in any color instead of foil, or an upgrade to a pocketfold for the Couture Suite. This suite features a simple invitation with all the lovely extras to bring that Queen City to your wedding. Suite pictured has die cut RSVP card and venue envelope liner, but is available in any color or an upgrade to letterpress, foil and/or a pocketfold for the Couture Suite. Forget the traditional wedding invitation wording, and invite your guests to your special day with a love letter. Includes all the important info, PLUS a tear-off RSVP card, this all-in-one lovely can mail all by itself, or in an envelope. Wax seal recommended (but not necessary) and is available in a WIDE variety of wax colors. Styled after the beautiful artwork of Alphonse Mucha, this art nouveau design borders your invitation wording with grace and style. Simple, yet elegant, this suite is sure to impress, and is available in any color, in letterpress or an upgrade to a pocketfold for the Couture Suite. Letterpress, foils, embossing, engraving, die cutting, edge painting; all those special options you've been craving, we've got 'em! Want something you don't see here? Just ask us. If it has to do with paper, we can do it. See something here that you love? Contact us today to set up a meeting! This gold foil and letterpress suite is a luxurious option for any upscale wedding. The peony and floral illustration in gold, rose gold, or silver foil is a lovely accent to your design. Suite shown here with white calligraphy and gold edge painting, but can be customized to fit your event! Also available in digital gold as part of our Standard Suite. A simple gold foil monogram, surrounded in a gold border, paired with black letterpress. Shown here with a gold, patterned envelope liner, and digital gold enclosure cards. Suite can be customized in your colors, and is also available in one color foil or letterpress printing, printed in digital gold as part of our Standard Suite, or paired with a pocketfold for our Couture Suite. This suite features a modern, type-heavy design, with our line of 20 existing landmark illustrations to choose from. Getting married somewhere not on our list? We can make one just for you! Suite shown in two color letterpress, with digital enclosure cards and RSVP envelope. Also available in all letterpress, or printed digitally as part of our Standard Suite. The art deco invitation of your dreams. This gold foil and digital mixed suite is an affordable blend of luxe texture and metallic golds. Suite shown here with gold foil and gold edge painting, with different shades of gold stocks, but can be customized to fit your event! Also available in digital gold as part of our Standard Suite, or paired with a pocketfold for our Couture Suite. A laser-cut lace pattern invitation is a delicate border on this romantic suite. This suite is shown with all the bells and whistles; wax seal, die cut RSVP card, envelope liner, and address label with calligraphy, but can be customized for your colors and with whatever add-ons fit your style and budget. adds that extra level of customization that will beautifully contain all the elements of your invitation suite. Perfect for suites with multiple enclosure cards, or weddings where more than half the guests will be traveling from out of town. Envelofolds and pocketfolds are perfect for keeping together all the information your guests need, and are easy to throw into a suitcase. These suites start at $7.50, includes the invitation, enclosure, blank outer envelope, and the RSVP card and printed envelope. From there you're free to add as many enclosure cards and bells and/or whistles you like to make a real statement about your event. Contact us today for a full quote! Pocketfolds are great for guests who need to travel with info, and with our extensive line of solid and patterned stocks to choose from, you're sure to find your perfect match. Band is available in a choice of solid or patterns, or as shown here with a custom crest. The design can also be simplified as our Standard Suite. Autumn florals tumble effortlessly from the top of this suite, setting a romantic tone. Colors in the flowers can be adjusted for Spring or Summer, and the pocketfold is available in any color. Suite shows with digital gold printing, and four enclosure cards. For events with less information to send to your guests, this design can be simplified as our Standard Suite. Contain everything in one piece without a pocketfold. Shown here with Park Country Club, digital gold printing, and attached RSVP and reception cards. For events with more information to send to your guests, this design can be expanded to include up to 4 layers.